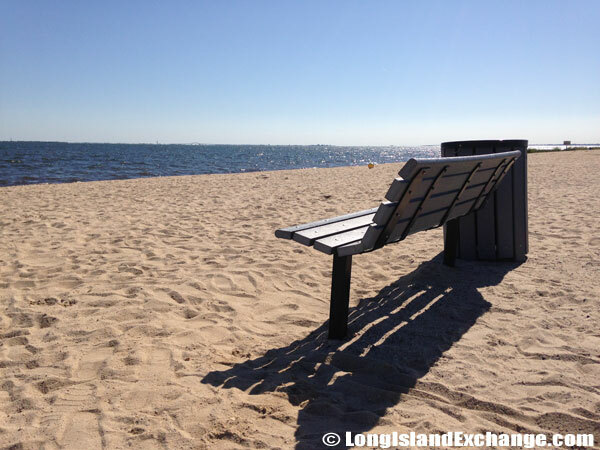 Heckscher State Park East Islip, New York. Directions: At the end of the Heckscher State Parkway, 50 miles from Manhattan on the south shore of Long Island, within the East Islip/Great River Area in Suffolk County. Entrance Fee: $8-10 per car. 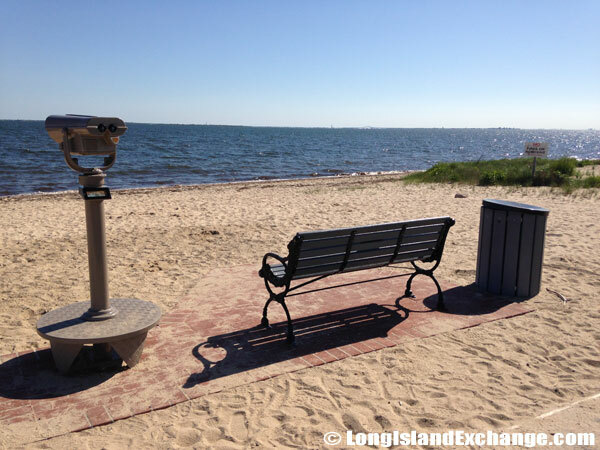 On Great South Bay, this 1,657-acre park draws boaters as well as landlubbers to its beaches. 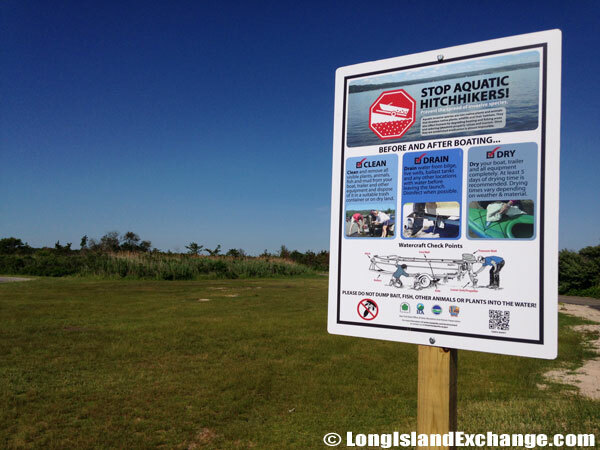 A sign welcomes visitors to Heckscher State Park at the end of the Heckscher State Parkway. 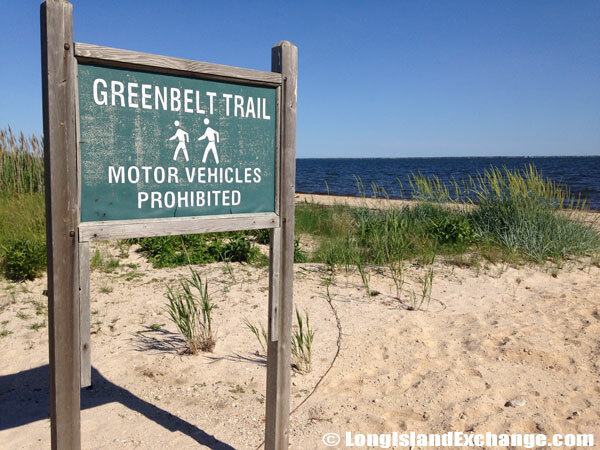 The 34-mile Long Island Greenbelt Trail passes through five parks: Heckscher State Park, Bayard Cutting Arboretum, Connetquot River State Preserve, Lakeland County Park, and Islip Greenbelt County Preserve. A sign helps stop aquatic hitchhikers by giving a step-by-step how-to on boat washing. 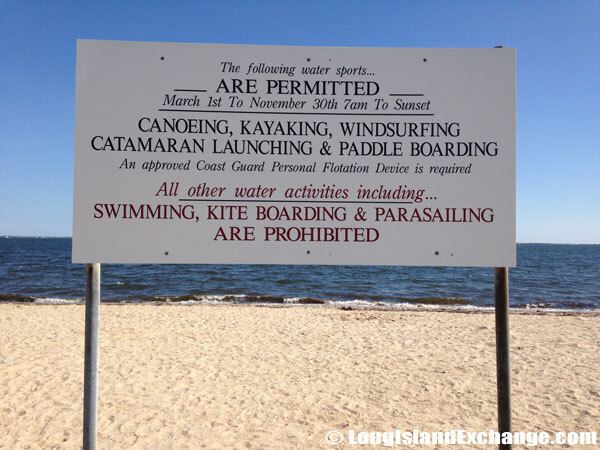 A sign tell visitors that canoeing, kayaking, windsurfing catamaran launching and paddle boarding are all aloud and permitted at Heckscher State Park as long as an approved Coast Guard Personal Flotation Device is used. 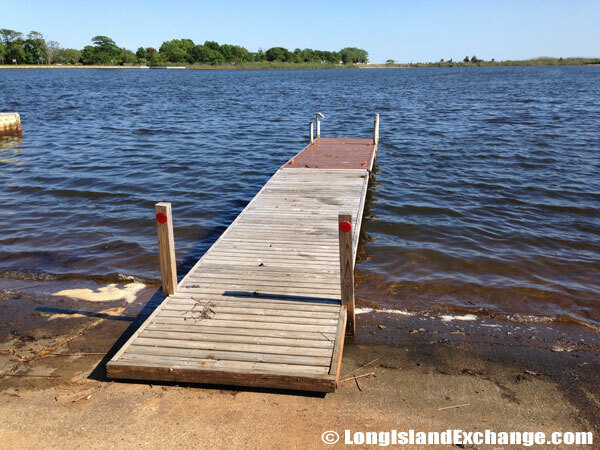 Overview: The 1,469 acres State Park offers a beach, picnic tables with pavilions, a playground and playing fields, recreation programs, hiking and biking, fishing, a campground with tent and trailer sites, cross-country skiing, a boat launch, and a food concession. Hechscher State Park is known as the “Home of the White-tailed Deer” because deer are famous throughout the park. The Heckscher State Park management has been moderate enough to even allow Pavilions on occasion, though nights in a regular and small tent can be more fun. Campers have a choice of 69 locations where they can pitch their tents-small wonder that the Heckscher State Park has made it to the chart of the top Camping Grounds in the United States. 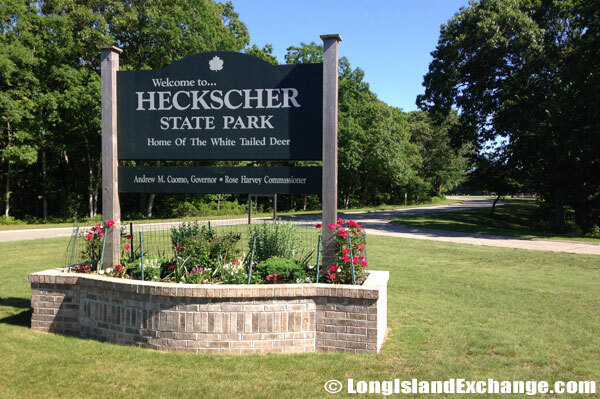 New Yorkers have an obvious advantage, but the Heckscher State Park also attracts quite a few people who reside rather far from Long Island. Looking out to the Great South Bay, situated between Long Island and Fire Island. Another spectacular view from the beaches of Heckscher State Park looking out to the Great South Bay. There are several areas designated for exercise, walking with stretching. Paved walking / bike paths. History: Hecksher State Park was once the 19th century estates of George C. Taylor and J. Neal Plum. William Nicoll, founder of Islip, was originally built his estate on this property. The park was bought by the State of New York using a donation by the affluent August Heckscher with strong opposition from wealthy local residents. 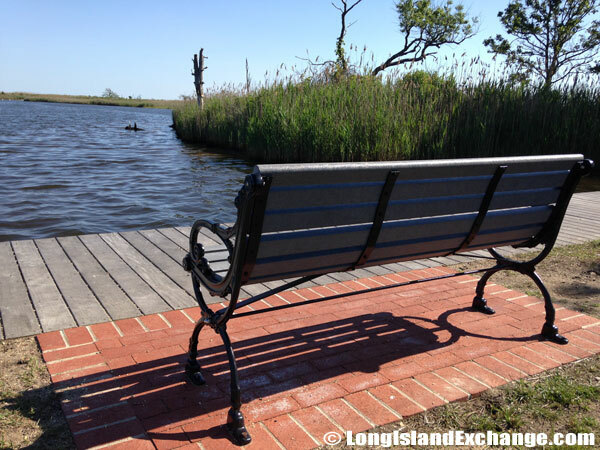 Today, Heckscher State Park is a great place for a visit when you need to spend some time in nature. Dogs are permitted in undeveloped areas only and are not allowed in buildings or on walkways. A quite spot to sit and look out near the boat ramps. 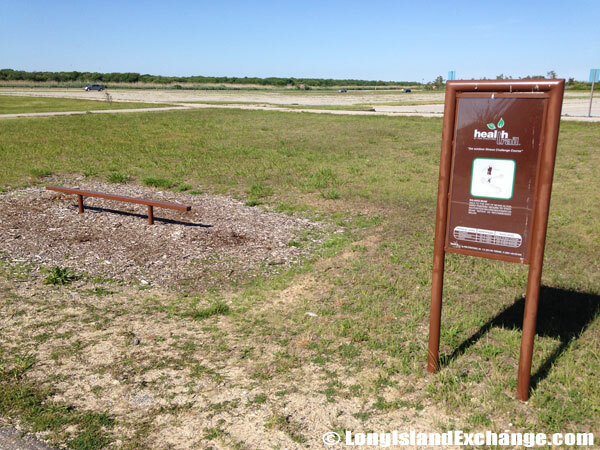 The boat launch site at Heckscher State Park Field 1. Facilities: Twenty miles of trails attract hikers, bicycle and cross-country skiers. Swimmers can use the Great South Bay or the swimming pool complex. Swimming facilities are provided at Overlook and West beaches and in the Overlookpool. There are picnic areas, a boat launch ramp, play fields, playground and 69 campsites. Only vehicles below eleven feet high can come into the campgrounds. 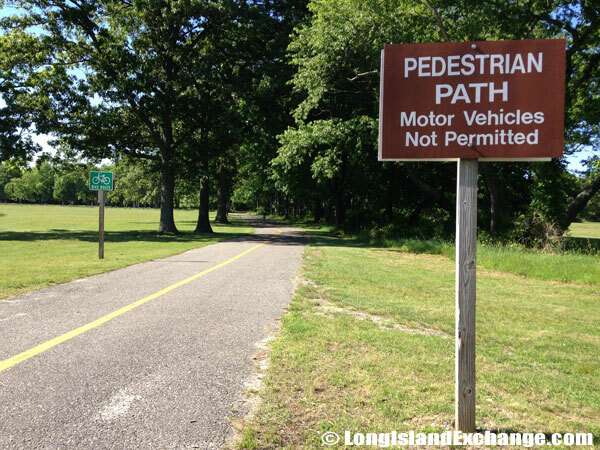 In addition, the 32-mile Long Island Greenbelt Trail passes through the park. 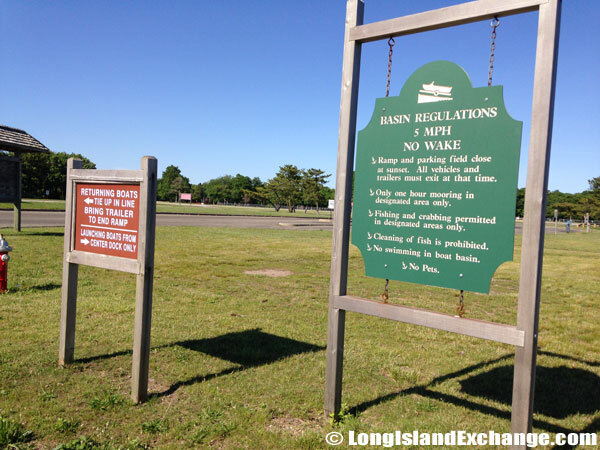 A sign explains basin regulations at Heckscher State Park. 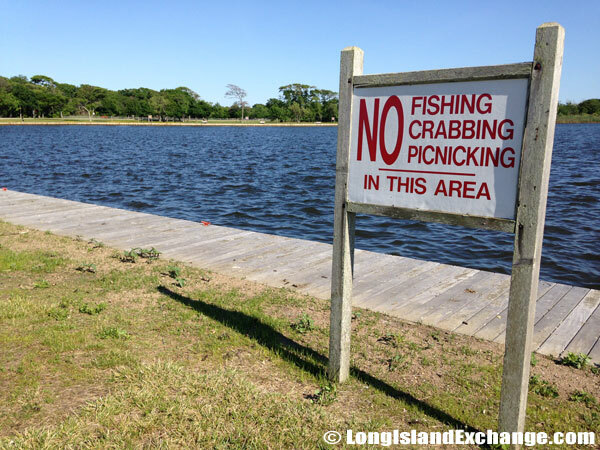 There is no fishing, crabbing or picnicking permitted in the area near the boat ramps. 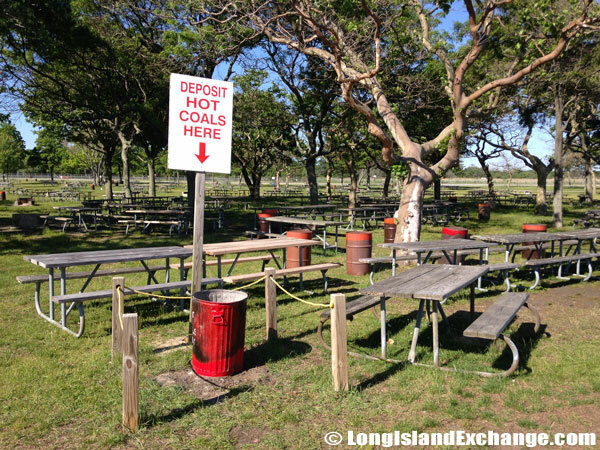 A sign shows visitors picnicking where to put used coals when finished grilling in barbecue areas. 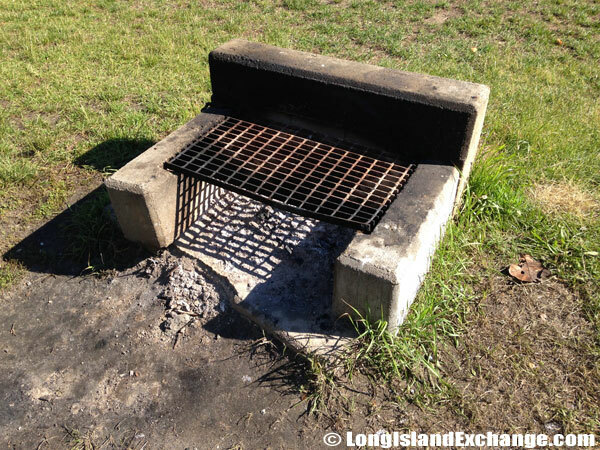 Visitors and friends can fire up floor grills in Heckscher State Park barbecue areas. Seasons/Hours: Open year round, seven days a week, 7:00 a.m. to sunset. Pets: Dogs only. 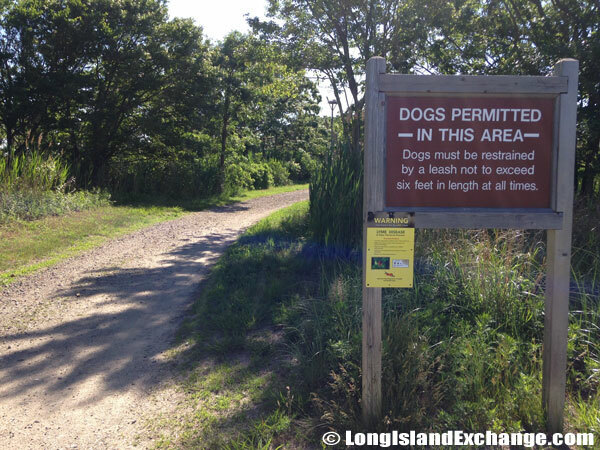 An access in undeveloped areas is only allowed, on a leash not more than 6 feet. Not allowed in camping, bathing and picnic areas. Not allowed in buildings or on walkways. Temperature: It is commonly wet place with much rainfall; throughout November this area sees the most rain while February is the month with least amount of precipitation. The area experiences average January temperatures above 22 degrees Fahrenheit (above -6 degrees Celsius). Summer temperatures average above 72 degrees Fahrenheit (above 22 degrees Celsius). Typically Long Island has more than 200 days of frost-free growing season. 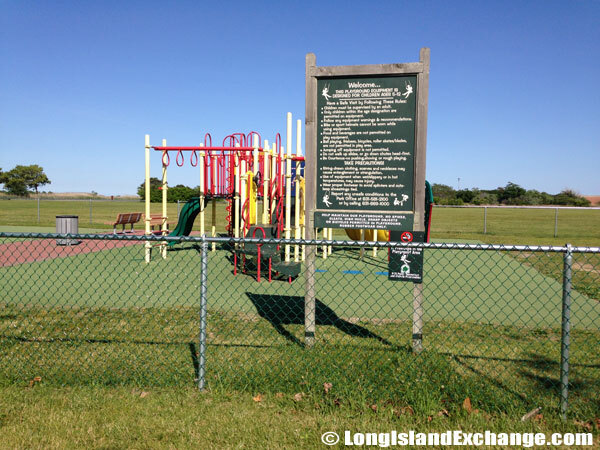 There are several designated children’s areas in various fields of Heckscher State Park. 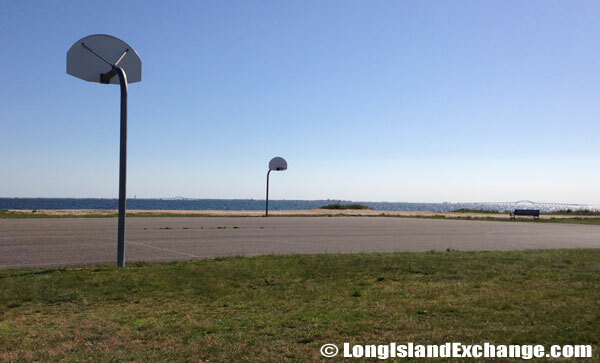 One of several basketball courts found at Heckscher, this one with views and a breeze from the Great South Bay. 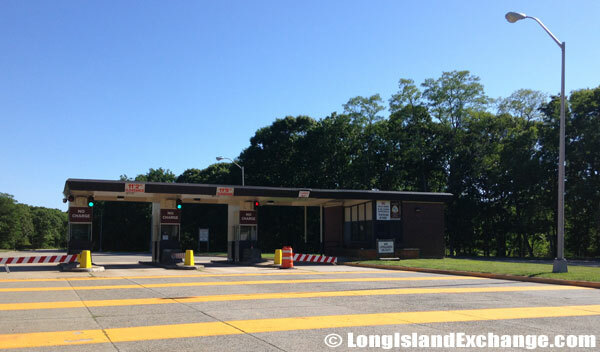 The toll booth areas for Heckscher State Park, which collect fees until 4PM on weekdays and 6PM on holidays and weekends. Events: Carl Hart Fall Duathlon; 1.8-mile run, 10.5-mile bike, 1.8-mile run, and Carl Hart Mother’s Day Spring Duathlon; 1.8-mile run, 10.5-mile bike, 1.8-mile run (dates not set).